Kathy was born and raised in Edmonton. 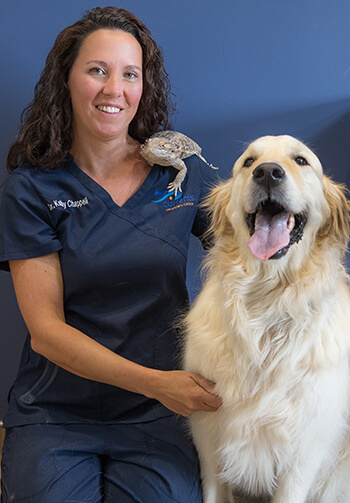 She has an extensive history in the veterinary field, having worked as an Animal Health Technologist for several years before going back to school to become a Veterinarian. She attended the Western College of Veterinary Medicine, graduating in 2006. Her career has been busy with locums, shifts in emergency medicine, while working full time in a small animal practice. Kathy believes that being a Veterinarian is one of the most interesting careers one can have. She strives to help educate clients so that they can have the best relationship possible with their pets. Her love for medicine, surgery and all things exotic is what drove her to become a veterinarian. She enjoys the challenge of treating a wide variety of species...all things furry, fuzzy and scaly! In her spare time she enjoys spending time with her family, friends and soccer is her sport of choice. Her two children, dog, cat and gamut of other animals that come through her door keep her busy during her time outside of work.